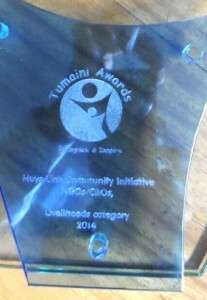 Toronto, June 4, 2015—Canadian Feed the Children (CTFC) is excited to announce that our partner HUYSLINCI was recognized with distinction by the 2014 Annual Tumaini Awards. The Tumaini Awards celebrate individuals and organizations who have had the greatest impact on children’s rights through health in schools, quality of education, child protection and livelihoods. This initiative is organized by the African Network for the Prevention and Protection Against Child Abuse & Neglect, Child Fund Uganda, Compassion International Uganda, Save the Children International, Uganda Child Rights NGO Network, UNICEF, and World Vision Uganda. HUYSLINCI won the first place award in the Livelihoods category out of nearly 170 NGOs for their evolution of the Breaking Barriers to Children’s Access to Education project model, supported by CFTC. The Tumaini Award was presented with a trophy, a certificate, and a fully-sponsored staff capacity-building training session in an area of HUYSLINCI’s choice. The Breaking Barriers to Children’s Access to Quality Education project has become a medium for social and economic change in the lives of vulnerable children and their families. Since 2010, the project has annually benefited more than 2,000 children who attend six partner-supported schools. Each accommodates up to 550 child ambassadors (children enrolled in the CFTC’s Sponsor a Child program). The Breaking Barriers program has also built capacity among teachers through pedagogical training and has strengthened school infrastructure. Thank you to all of our supporters and funders who help make CFTC and its local partners stronger, and capable of helping children thrive with ever-increasing impact and effectiveness.